I have been a Ham since 1984 and currently hold an extra class license. Hobbies include amateur radio, RVing, and golfing. I work mainly the HF bands and often drop down on the CW portion to work qrp. I am active in emergency communications with the Hospital Disaster Support Communications System (HDSCS), which is an ARES group supporting 26 hospitals in our county. 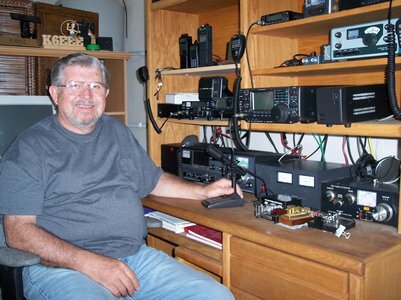 I am also membership director for the South Orange County Amateur Association.......a group of 170 hams. I am a member of ARRL and ARCI. My station consists of an old Swan 400 (on the left), Icom 746 Pro, Icom 706 for mobile, My qrp rigs include a Heathkit HW 8 qrp and a Ten Tec Argonaut V. Currently my antennas are a G5RV along the roof line and a Alpha Delta DXEE in my attic. Hope to hear you on the bands............73 from San Clemente, California............the best climate in the world.